Who said there was no drama in the golfing world? In less than three months, the world’s number one and two golfers have been accused of cheating. 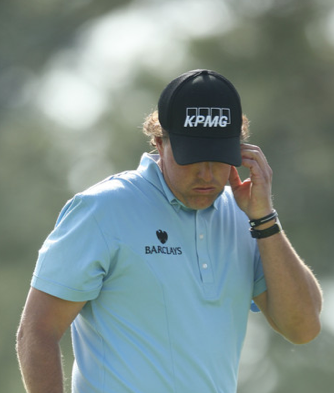 Last week when Phil Mickelson announced he would be playing with a Ping Eye-2 lob wedge — which doesn’t conform to the new groove regulation but is permitted within the rules because of an old lawsuit — he sparked a very public and ugly spat on the contentious issue. 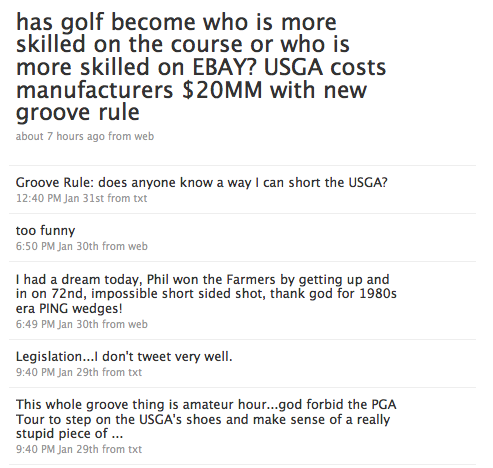 Ryan Ballengee makes a compelling case, arguing that Phil’s decision didn’t have anything to do with performance; rather it was a calculated move by him and his sponsor Callaway Golf to stir up controversy in attempt to embarrass the USGA (and PGA Tour). We all have our opinions on the matter, but a line was crossed and I just was publicly slandered. And because of that, I’ll have to let other people handle that…Again, everybody has their opinions and so forth, and it’s healthy to talk about it. But when you cross that line and slander someone publicly, that’s when the Tour needs to step in – or someone else. 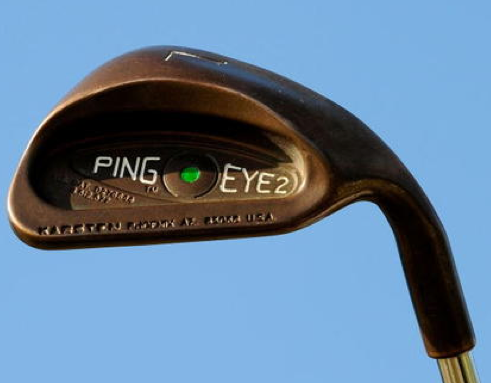 • Because the use of pre-1990 Ping Eye 2 irons is permitted for play, public comments or criticisms characterizing their use as a violation of the Rules of Golf as promulgated by the USGA are inappropriate at best. I never called Phil Mickelson a cheater. That being said, I want my fans, sponsors, and most importantly, my fellow players, to know that I will not be silenced and I will continue my efforts to get the groove issue resolved. The USGA and the PGA Tour were made aware of this potential issue by its players last year. Instead of acting or addressing the matter, the tour chose to put the onus to comply on its players. Unfortunately, a handful of players have chosen not to comply and that is what has led to this current ordeal. In my opinion, as a 16-year veteran of the PGA Tour and a member of the tour’s Player Advisory Council, the tour must now put a rule in place to protect the field and ban these wedges. Most of the players on the PGA Tour feel the loophole in this rule needs to be closed. So there you have it — McCarron will not permit threats of lawsuits or fines to shut him up on his heroic crusade. Scary! Seriously speaking, the Tour should have foreseen the inevitable outrage and taken measures to prevent this from turning into such a mess. I would like to see a clarification myself. I would like to see a situation. Legally I don’t know how they can go about it, but maybe the PGA TOUR could play under the rules of the R&A, then we’d have no problem. Maybe Ping could forego the lawsuit, then there would be no problem. Or possibly, I don’t know, this is what I would sort of suggest, is that maybe everybody sign up to a charter and say we won’t use them. But while they’re out there being used, it’s a difficult situation not to — for anybody who’s competitive not to go out there and take full advantage of what you can if somebody else is. …I’m hoping for some good clarification this afternoon from Tim Finchem. I’m hoping something comes out of that that makes the decision and takes the decision out of my hands, really. But aren’t the Tour’s hands tied because of the 1990 lawsuit settlement that came after Ping sued the USGA? If that’s the case, then we’re being run by a lawyer, not by a commissioner. If that’s the case, let’s fire Finchem and hire an attorney. What disappoints me about the players [using the Ping wedges] is that they’re finding this loophole to go around the rule. So you would never play these Pings, even though they’re legal? No. My conscience wouldn’t let me. At the same time, I would never say that a guy is cheating. There are times to keep one’s mouth shut. It can’t be cheating if it’s allowed in the rules. But can you say it’s against the spirit of the rules? Yeah. I think it is. In my era, Jack Nicklaus and Arnold Palmer, in the spirit of competition, would not have [played Ping Eye2s]. But we play in a different time. To circumvent the rules by playing old grooves is going outside the spirit of competition. Phil doesn’t need to do that. So, Irwin agrees with McCarron that Phil is essentially cheating. Let’s hope Finchem can help put this all to rest when he addresses the matter in more detail in a press conference tomorrow. On the bright side, at least everyone is up in arms about a controversy dealing with play (or alleged cheating) on the course — you know, rather than Tiger’s dalliances with his (alleged) dozen or so mistresses.